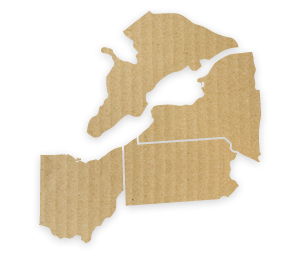 At Jamestown Container Companies, we’re bringing better corrugated packaging services to the Great Lakes region by putting our customers first. Our expert team is a group of problem solvers and innovative thinkers. We’re able to look at our customers’ packaging challenges from a position of experience to help them find the best solution. From creating package designs that attract more customers and reconfiguring how products are placed in packages, to optimizing your packaging inventory, helping to reduce shipping costs, and more, Jamestown can handle every aspect of your packaging from start to finish. Jamestown Container is helping businesses stay competitive in their industries by designing custom corrugated packaging solutions with fast turnaround times and superior quality. The majority of our products are made with lightweight, 100% recycled material to achieve performance strength without sacrificing sustainability. With less time spent worrying about your product packaging, you’ll be able to direct your attention to the more crucial and cost-driven aspects of your business. At Jamestown Container Companies, we’ve been creating and designing smarter corrugated packaging solutions for businesses since 1956. Our packaging team is dedicated to being a partner to each and every one of our customers to ensure they’re getting the most out of our packaging services, from start to finish. Take a look at some of our testimonials to see what our customers have to say about the solutions our team has created for them. We’ve worked through a number of packaging challenges over the years, and our expertise is only a fraction of the reason why businesses choose to work with us. Interested in learning more about how your business can revamp your product packaging to cut costs and stand out from your competition? Contact us today.